Shirts With Random Triangles: Twin Peaks Teaser Trailer, Plus Which Original Series Actors Beside Kyle MacLachlan Will Return. Kyle MacLachlan will reprise his role as FBI agent Dale Cooper in the new series. As for the rest of the original Twin Peaks cast, IMDB only confirms Sheryl Lee (Laura Palmer), Kimmy Robertson (Lucy Moran), and Dana Ashbrook (Bobby Briggs) as appearing in the series on a more regular basis. Joining them as regulars are Balthazar Getty (Brothers & Sisters), and Amanda Seyfried, in undisclosed roles. Others original cast members such as Russ Tamblyn (Dr. Lawrence Jacoby), Madchen Amick (Shelly Johnson), and Laura Flynn Boyle (Donna Hayward) are confirmed by IMDB as appearing in at least one episode of the series. Dazed reports Sherilyn Fenn (Audrey Horne), Richard Beymer (Benjamin Horne), and Michael Horse as Deputy Tommy Hill, as making appearances in the series as well. 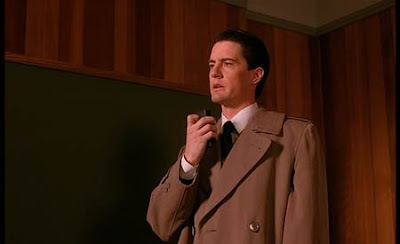 The revived Twin Peaks is scheduled for an eighteen-episode run on Showtime in 2017.